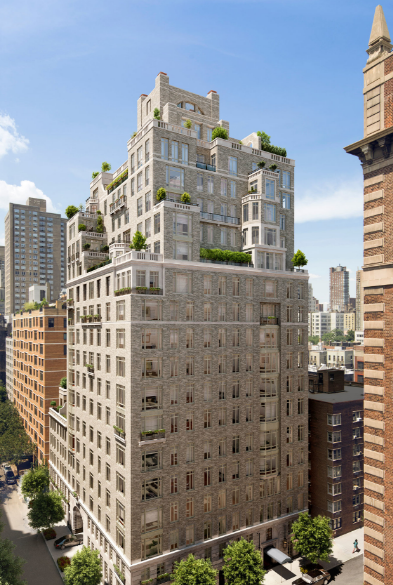 20 East End Avenue, designed by internationally renowned Robert A.M. Stern, is a new condominium located on the northwest corner of 80th Street and East End Avenue in Manhattan’s prestigious Upper East Side neighborhood. The building comprises 43 two- to six-bedroom residences, including three triplex Town Homes and two stunning Penthouses. With custom interior and exterior design by Mr. Stern, 20 East End Avenue features a truly unprecedented level of design, planning, detailing, and quality. 20 East End Avenue’s design concept embodies the heritage of distinguished pre-war architecture, including traditional 11’ to 13’ ceilings typical of that era, unparalleled finishes, and meticulous, generously-scaled, floor plans. The exterior is marked by an intricate brick and handset grey limestone façade with oversized bay windows designed to maximize light and views of the East River and the Upper East Side. Many residences feature private setback terraces, and select residences include private gardens along with outdoor gas and wood-burning fireplaces. The arrival experience features an intimate, gated motor court with trellis garden pavilion leading to a luxuriously detailed octagonal lobby with a grand architectural stair connecting residents to three floors of amenities. Additional building amenities include: 24-hour concierge, graciously-appointed library with book collection curated by Robert A.M. Stern, billiards room, game room, wine cellar with private dining room, fitness center and spa, children’s playroom, and bicycle storage.